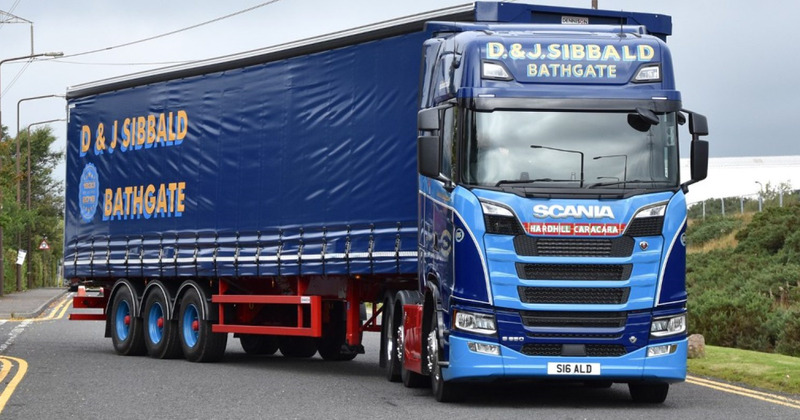 Family business D&J Sibbald is celebrating its 85th anniversary with the purchase of a Scania S 650 Highline V8 tractor unit from Scania Scotland. The vehicle has been named ‘Hardhill Caracara’, after a bird of prey with black feathers and a red beak which is reminiscent of the black leather trim and red stitching in the 16-litre V8 vehicle. While it features the same livery as the remainder of the fleet, which is all Scania R-series, it has also been fitted with alloy wheels. The truck will be used for general haulage business throughout the United Kingdom transporting a variety of goods including construction materials, industrial components and fast moving consumer goods. The business has a strong history with Scania as the first Scania vehicle purchased by the founders David and John Sibbald was a Scania 111 4x2 in 1975. It is estimated the truck will clock up around 160,000km a year and will be driven by William McCracken, a driver who has been with D&J Sibbald for over 30 years.